The Sepasoft™ Track & Trace Module provides you with product traceability, real-time inventory management, and operations management tools for your industrial processes. 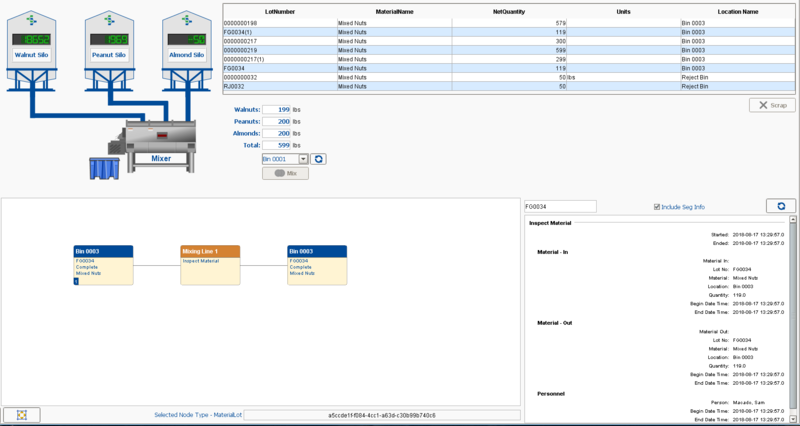 Build in error proofing and record the material, equipment, personnel, and processes utilized on your plant floor with our module. Tracking and tracing are the processes by which manufacturers obtain and record highly important information about where and how products are made. Our Track & Trace Module automates this process and has become a modern necessity for manufacturers as their industry faces increasing economic and regulatory challenges. Contextualize all relevant data with Track & Trace. Add our Track & Trace Module to the Ignition® platform for the capability to look up where any product has been during its manufacturing process, and where it is now. Our Track & Trace software fits into the Manufacturing Execution Systems (MES) / Manufacturing Operations Management (MOM) layer that resides between the Enterprise Resource Planning (ERP) layer and the plant floor. The Sepasoft™ Track & Trace Module is unlike any other traceability application on the market. Our module can also be used to query data from ERP systems. The Sepasoft™ Track & Trace Module provides navigation and linking of internal and external data together in an easily understandable visual display. Furthermore, it also allows any enterprise to standardize its system across multiple facilities. With our Track & Trace Module, you can search for product information through a unique and easy-to-navigate Trace Graph display. The Trace Graph displays your search results in a visual format with the raw materials on the left, the manufacturing procedures in the middle, and the finished products on the right. The Trace Graph allows you to see all of the processes, runs, lots, and routes each product passed through. All of this information is organized chronologically and displayed in one place, making it simple to find the exact information you need. Our Track & Trace Module brings together OEE, SPC, ERP, recipe, trends, and more information, placing it at your fingertips like never before. Quickly get action summaries. View trends within Sepasoft™ MES, and query external systems such as ERPs or warehouse management systems. See correlations between efficiency and quality. Keep an eye on historical trends and access information related to compliance. The variety of valuable data gives you more insight to make better decisions. Track & Trace allows manufacturers to transition away from the outdated practice of recording traceability information on paper. Instead, you can keep information alongside the rest of your system data on a unified platform where it is easy to analyze and retrieve. In addition to manually entered tracking, automated tracking helps to greatly increase accuracy, speed, and efficiency. Certain industries are facing an increased regulatory demand for traceability information. For instance, in the United States, the Food Safety Modernization Act and the Drug Quality and Security Act are establishing new national standards for food and drug traceability. The Track & Trace Module helps enterprises track their products through the supply chain and avoid fines by providing quick access to traceability information requested by government authorities. Unlimited active operations per physical production site and Ignition server license. One line level equipment item and children enabled to run active operations (tasks) per machine license with unlimited segments (sub-tasks) under the operations. Traceability software is essential, and the Sepasoft™ Track & Trace Module offers a simple-to-use, flexible, powerful, affordable, and complete solution for your enterprise.